At Hikvision’s Spring Insight events across the UK and Ireland, security installers and systems integrators got a first look at the company’s latest product releases and forthcoming technology. 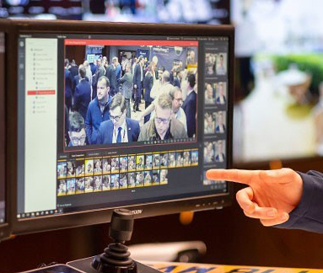 The events, in Dublin, Bristol, Manchester, Birmingham and London, drew more than 750 industry people for hands-on demonstrations with Hikvision technology integration and distribution partners. Hikvision gave updates to products including its Turbo HD, Pro, PTZ, Panoramic and Thermal series cameras as well as its access control and video intercom ranges, besides the developments across Deep Learning, Radar and HikCentral software. In the Turbo HD Analogue series, new PIR alarm-out cameras were shown, which work with motion detectors and Turbo HD 5 series DVRs to offer ‘double knock’ alarm confirmation. The alarm also causes a flashing white strobe light on the camera to trigger, attracting the intruder’s involuntary attention and helping to obtain a clear image of the suspect. Attendees saw how entry-level Pro Series 4.0 (EasyIP) cameras are now able to use AcuSense, to classify targets when reviewing alarms – allowing operators to search specifically for humans or vehicles. In the PTZ series of cameras, the 4MP PTZ DarkFighterX model now features a chipset which offers twice the resolution and can operate at half the light levels of the earlier PTZ DarkFighter version, the firm reports. And the ‘bubble-less’ DarkFighter PTZ models offer newly-added infrared lighting. The latest version of the PanoVu 180 panoramic camera provides quadrupled resolution, using four 8MP chips to provide a 32MP scene, for retrospective interrogation. The new 12 megapixel Fisheye H.265 model offers data extraction tools, including intersection analysis and a Deep Learning-based heat map. The company now produces its own thermal imaging sensor, which allows it to offer thermal cameras for use in a variety of applications. They are for short-range perimeter detection, industrial heat detection, and smoking detection applications, among others. The Bi-spectrum turret and bullet models fuse video and thermal feeds together for more usable evidence. Attendees were also given a look at new Deep Learning-powered AI Shelf Detection software, which uses a technology called ‘planogram management’ to enable retailers to receive automatic notifications when their stocks need replenishing. The manufacturer’s next-generation Radar Series will be able to control up to four PTZ units at any time, allowing them to simultaneously track up to 32 detected targets – and by mid-summer their effective range will double from the current range of up to 60m. As for the HikCentral software management, new features include fisheye de-warping, an open SDK for third party integration, dynamic re-scaling of images, ANPR as a single camera module down from a previous minimum of 20 cameras, live face recognition, Business Intelligence reporting, and proactive health monitoring. HikCentral now incorporates an integral access control module to complement Hikvision’s Access Control range.